Watching wide-eyed travellers, standing in the Te Anau Visitor Information Centre trying to decide whether to cruise Milford or Doubtful Sound is always entertaining. Milford Sound receives over half a million visitors each year, but what about its lesser-known neighbour Doubtful Sound? The name ‘Sound’ is actually a misnomer as glaciers, not rivers carved out these fjords. Maori mythology suggests that Tute Rakiwhanoa used his giant digging stick to sculpt the steep sided valleys and when the Maori people first arrived; they used the area for seasonal food-gathering and greenstone hunting. 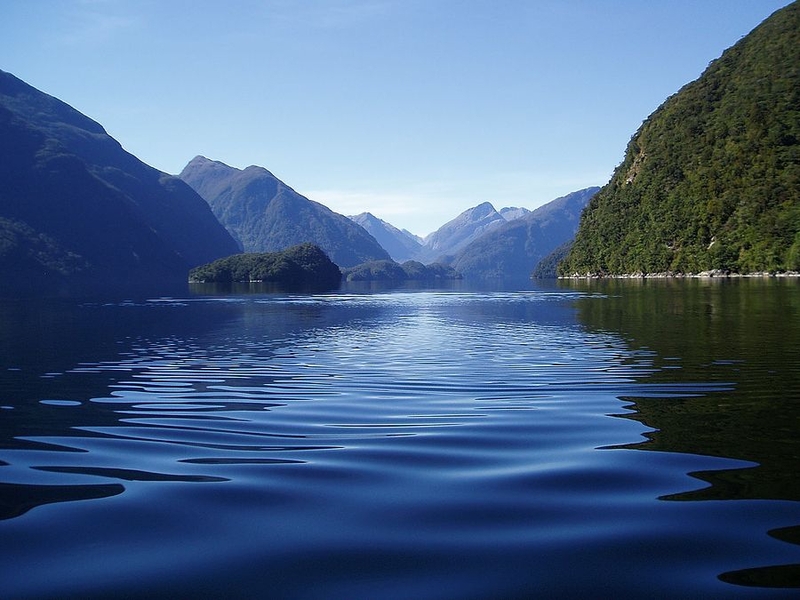 Captain Cook discovered Dusky Sound in 1773 and named it Doubtful Sound – doubtful he could sail back out again. He missed Milford altogether, and it was John Grono who christened this Sound in 1823. Welsh visitors find this amusing as Milford Haven in Wales is home to an oil processing plant and industrial area, nothing like the picturesque New Zealand version. In both Milford and Doubtful Sound, there are two distinct layers of water. The top 10 metres of freshwater is naturally stained by tannins from decomposed vegetation. This dark layer creates a reflective surface and stops much of the light from reaching the relatively warm seawater underneath. Sea life normally found at great depths live only 30 metres below the surface, making Fiordland one of New Zealand’s top dive spots. 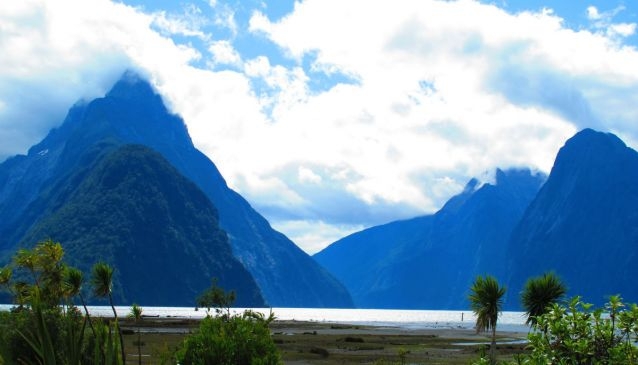 It takes around 2 ¼ hours to drive the 119 kilometres from Te Anau to Milford. Although, if you are self-driving, camera in hand, I’d schedule at least three hours. Also, be warned, the signs saying ‘Warning Avalanche Hazard’ and ‘No Fuel Available’ mean business. At Milford Sound, the Visitor Centre and ferry terminal looks more like an airport, almost Thunderbirdsesque’, and if you want to explore the Sound, you can cruise, kayak or take a trip in an underwater submersible. Standing dockside, I realise that 20,000 years ago the exact same spot would have been covered in nearly two kilometres of ice. Discoveries also operate trips) Our Skipper Caleb, explains that in places the Sound is three kilometres wide and over three hundred metres deep. I look upwards to some of the highest sea cliffs in the world - rising 1,200 metres straight out of the water and enjoy the full frontal chocolate box shot of Mitre Peak dominating the skyline. Dodging the spray from Stirling Falls on the foredeck is a life affirming experience and everyone on board enjoys spotting wildlife. New Zealand fur seals kekeno catch the sun on Bachelor Rock, and a Fiordland crested penguin or tawaki, trying to hide in his own shadow steals the show. I finish my cruise thinking that nothing could beat the Milford experience, but that was before I visited Doubtful Sound. The wharf at Pearl Harbour on Lake Manapouri is a half hour drive from Te Anau. It marks the beginning of my complete East to West crossing of Fiordland National Park. On the map, the lakes fit together like tetras, and as a visitor to Doubtful Sound, I have to earn my bragging rights. We cruise across Lake Manapouri to the West Arm Power Station, drive over Wilmot Pass and board our cruise boat. Lake Manapouri, with its 33 islands is New Zealand’s second deepest lake. The Fiordland Flyer, motors past Pomona Island, a predator free sanctuary towards the dock. Chris Moon, our Nature Guide, meets us at the West Arm Visitor Centre. He possesses both a sense of humour and an in-depth knowledge of the area’s natural heritage. “Don’t kill sandflies! It’s a National Park and there’s an extra penalty fee if you squash them on the windows” he quips. Wilmot Pass marks the point where beech forest gives way to mixed podocarp confers. Here, the annual rain gauge levels change from three metres in West Arm to 6-8 metres in Doubtful Sound. Looking out to Deep Cove and Elizabeth Island on a clear day is like looking back in time, I half expect Captain Cook to sail past in the Endeavour. 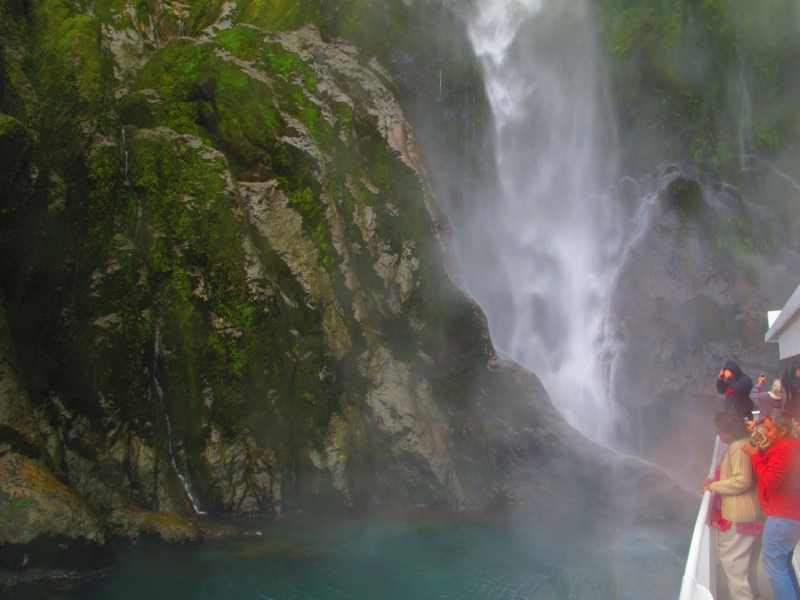 The Maori name for Doubtful Sound is Patea, which means ‘the place of silence’ and the name certainly fits. No helicopters or planes fly overhead and the ‘splendid isolation’ that the early explorers wrote about can still be experienced. At 421 metres, it is New Zealand’s deepest fjord and was once frequented by bloodthirsty whalers and sealers. Luckily today, Doubtful Sound is part of The Gut Te Awaatu Marine Reserve and the wild life is allowed to roam undisturbed. From Deep Cove, we cruise on the Patea for more than 30 kilometres to the Tasman Sea. We sail past craggy peaks and waterfalls, the tallest, Browne Falls is 619 metres high. The Shelter Islands, at the mouth of Doubtful Sound are a breeding ground for fur seals and penguins. By the time our captain turns off the engines so we can experience “screaming natural silence” my mind is visually overloaded. Only to be entranced yet again, this time by a pod of hectors dolphins. Back on land, driving into the side of a mountain to the bowels of the power station is another head spinning experience. One minute we are on water in remote wilderness, the next we are deep underground viewing a hydroelectric power station. Every second over 80 Olympic swimming pools of water, churn through the power station, which was originally the focus of New Zealand’s most effective conservation protest. A petition with 265,000 signatures was presented to parliament demanding that the lake remained at its natural levels. In 1972, the labour government honoured its election promise and the power station was built with the lake levels remaining unchanged. My conclusion as to which trip is best? 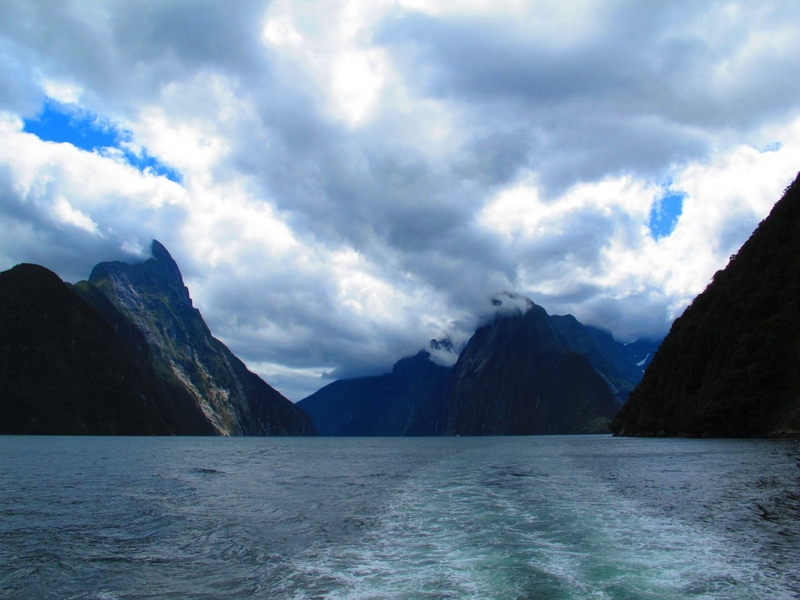 Milford Sound delivered on all its promises, but Doubtful Sound took me to another realm. It was the ‘we are the chosen few’ seeing this magnificent area where progress, engineering and wilderness conservation can co-exist that will draw me back to cruise again.